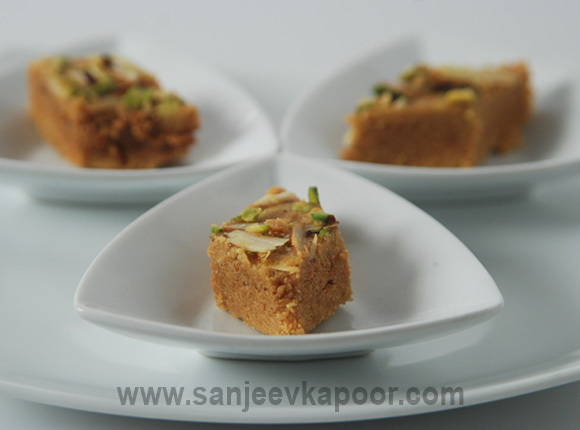 Gram flour sautéed in ghee mixed with sugar and dried fruits, set and cut into squares. 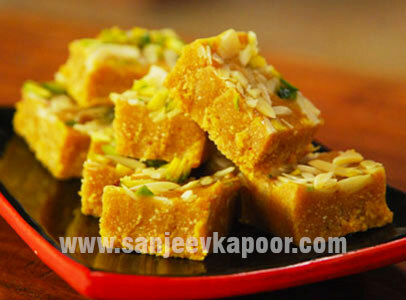 Try this burfi once, and you will keep coming back for more. 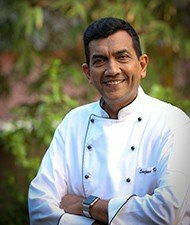 Nostalgia and a trip down memory lane – pinni has that effect on me. I am transported back to my childhood in Punjab, when simple pleasures came in sweet balls of dough. My mother-in-law makes the most awesome Mohanthaal, a traditional Gujarati mithai. It is one of those versatile soul-satisfying sweets that fulfil several needs – a comfort food, a pick-me-up, or a celebratory offering. This confection of a multitude of tiny golden gram flour pearls fused into a syrupy ball is a North Indian contribution to the Indian mithai platter. Believed to have been created in the kitchens of the Mysore palace, this sumptuous, honeycombed mithai saturated with the purest ghee lives up to its royal beginnings. Gulab Jamun - How to make soft, luscious jamun floating in a pool of liquid gold. This is one of those recipes for an all-time favourite that you can master in minutes. 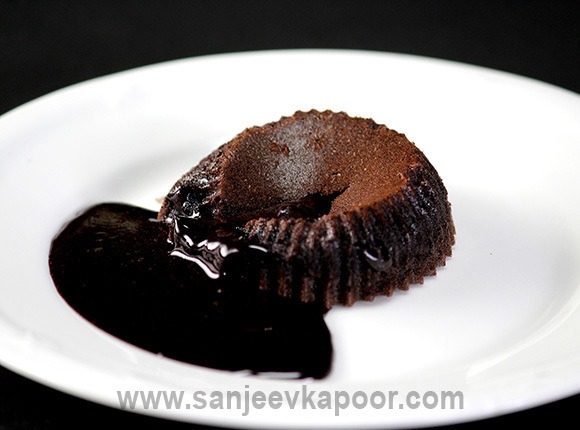 Just follow the steps exactly and you will be rewarded with soft, luscious jamun floating in a pool of liquid gold. 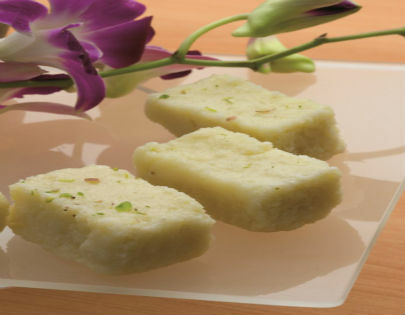 Kalakand - Who can resist rich milky granules compacted into squares of sweet satisfaction. Who can resist rich milky granules compacted into squares of sweet satisfaction. Kesari Indrayani - This one’s a favourite on our restaurant menu… tiny rosogulla soaked in rich and creamy saffron-flavoured milk…a magical treat, both for the eyes and the taste buds! This one’s a favourite on our restaurant menu… tiny rosogulla soaked in rich and creamy saffron-flavoured milk…a magical treat, both for the eyes and the taste buds! 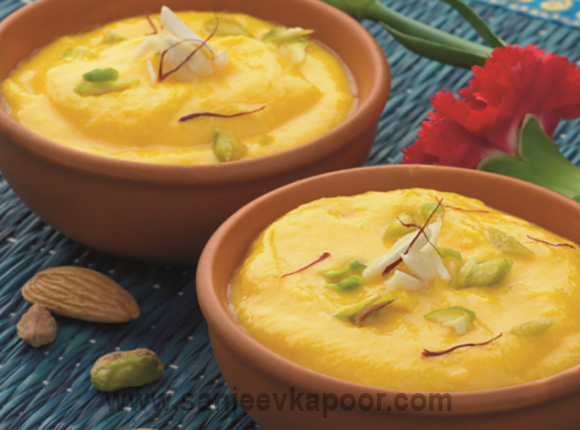 Kesari Shrikhand - A dollop of this creamy, velvety dessert described as ‘ambrosia of the gods’, will definitely transport you to a celestial plane. Sweetened hung yogurt flavoured with cardamom powder and studded with crunchy mixed nuts. The addition of saffron gives it a beautiful colour and aroma. Chilled shrikhand along with hot puris make a delicious combination for any festival. 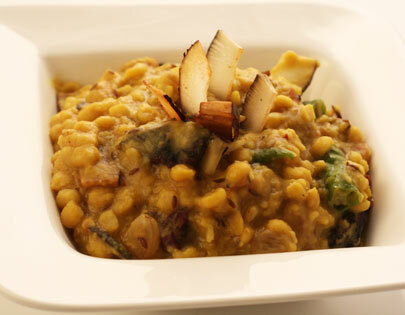 Cholar Dal - Another Bengali speciality - fresh coconut slices and raisins make this chana dal extra tasty. Another Bengali speciality - fresh coconut slices and raisins make this chana dal extra tasty. Cut into this delightful nugget and watch that stream of warm sweet chocolate ooze out, only to be captured by your spoon! 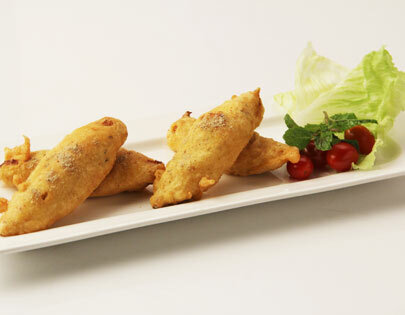 Baby Corn Paneer Ke Pakode - Marinated babycorns coated with spicy paneer mixture and batter fried. Marinated babycorns coated with spicy paneer mixture and batter fried. 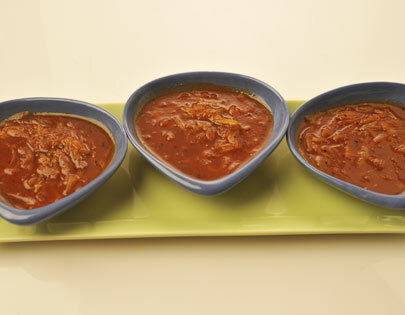 Lauki Ka Murabba - Bottle gourd sweet relish. 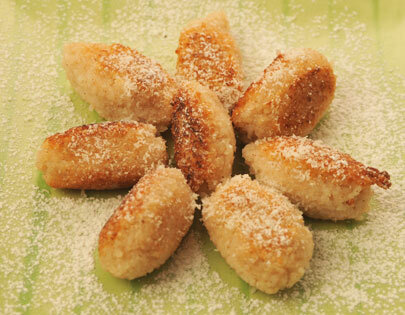 Coconut Rice Fritters - Sweet fritters - cooked rice mixed with sugar, coconut milk powder and flavouring. Sweet fritters - cooked rice mixed with sugar, coconut milk powder and flavouring. 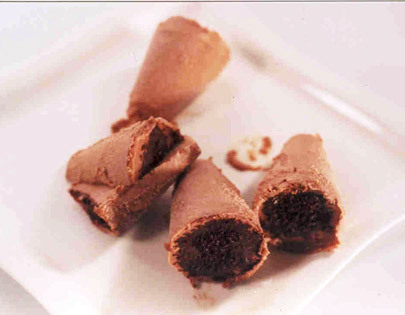 Chocolate kulfi - How to make Chocolate kulfi. Kulfi with the ever popular chocolate! Nimbuwala Chicken - Chicken steeped in lemon flavour. Lemon Chicken is an easy and tasty chicken appetizer recipe which can be made in just couple of minutes. Chicken steeped in lemon flavour. 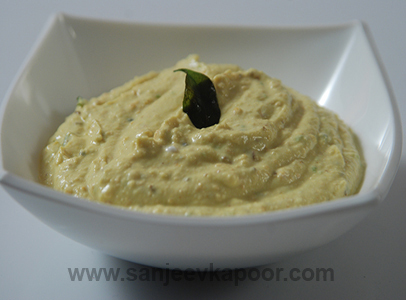 Daalia Chutney - Spicy Bengal gram chutney. 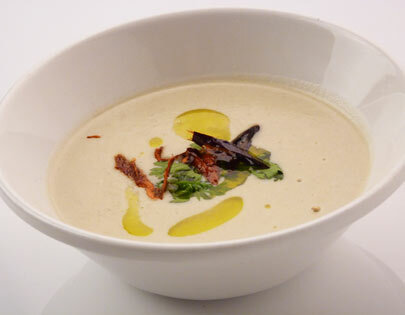 Brinjal and Smoked Chilli Soup - Roasted brinjal and cream soup served garnished with coriander leaves and sauteed chilli strips. 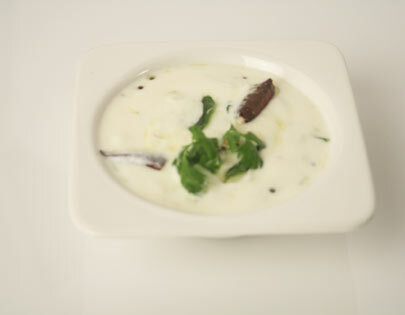 Roasted brinjal and cream soup served garnished with coriander leaves and sauteed chilli strips. Vellarikai Pachidi - Mildly tempered cucumber salad. Sorshe Diye Kundri - Ivy gourds or tindora cooked with mustard paste. Ivy gourds or tindora cooked with mustard paste.